In reading (and perhaps in life) I am a chaser of rabbits: I miss the blasted obvious and go careening off after the details: a sort of literary laborador. If I had been Lewis Carroll’s Alice, I would have gone headlong after that albino bunny as well, I’d want to know what kind of watch and what colour waistcoat: only, in the course of hot pursuit, I would probably have tripped over an enormous tree root that nobody else could possibly have missed. But the really embarrassing thing about my first reading of Rebecca was that, for a good chunk of the book, I missed one of the most famous technical sleights of hand in modern literature: the fact that the narrator is nameless, or perhaps it’s truer to say I missed it’s implications. It is generally understood that this lack of a name is unproblematically symptomatic of how our heroine’s identity is all but blotted out by her unfeeling husband and by the spirit of Rebecca, his charismatic first wife whose name dominates the book. I quite literally misread this. I was bowled over by the romance of some of Maxim de Winter’s early words to the narrator, ‘you have a lovely and unusual name’. Having a slightly unusual name myself, I knew what a relief it would have been to hear that those words, rather than the usual ‘how do you spell it?’: indeed the narrator clearly has the same problem. Maxim sends her a cryptic note ‘but my name was on the envelope and spelt correctly: an unusual thing’. So, you see, I obsess over details and when it comes to appreciating the literary elegance of the withheld, I have all the sophistication of a six-year-old. I want to know. That which is elegantly withheld itches away at me and eventually I do it myself: I turn detective and become the literary equivalent of the conspiracy theorist, if the evidence is still missing, after forensic analysis, I fill in the gaps and (the dangerous bit) start to let it colour my readings of the novel. I did this unconsciously in the case of the narrator’s name, due to a convenient piece of ignorance on the subject of etiquette (very Mrs de W). When she goes into the morning room on her first morning at Manderley, the narrator opens the drawer of what is now her desk and finds visiting cards with ‘Mrs M de Winter’ printed on them. I didn’t know, back then, that a good bride automatically took not just her husband’s surname but his first name too: I didn’t read those cards as ‘Mrs Maxim de Winter’ I thought it was her initial, a first clue! Watson, the game’s afoot! M. I started filing through my mental Rolodex of names beginning with M, looking for ‘lovely and unusual’ Mary? No, Maria? not unusual enough, Martha? not lovely enough, Muriel? just no. Marianna? Yes. So, you see, I always ‘knew’ Mrs de Winter’s name and it coloured my reading of the novel. It reminded me of something which, in the headlong and understandable rush to label Maxim a misogynist and a disgrace to husbands everywhere, often gets forgotten: while we, The readers, do not know his wife’s name, Maxim does and he appreciates it. When he says that she has ‘a lovely and unusual name’, is there a hint that he wants her for something other than her ‘funny, young, lost look?’ that she is more to him than a foil for Rebecca? When they are driven together in exile, is this something that holds them together? It is surely significant that when Maxim finally confess to his new wife, ‘he began to kiss me, hungry and desperate, murmuring my name’. He needs her to be more than his wife, he needs her to be herself and, in murmuring her name, These two have a secret, a little intimacy that we will never know. It is also worth remembering that Maxim de Winter himself has also suffered a little martyrdom due to his name. His tormentors: the press, Rebecca’s lover, Rebecca herself, call him Max. It is the narrator who says ‘it sounded racy, horrible’ but it is clear that Maxim never likes it and is too much the gentleman, too hidebound, to object. So de Winter knows a thing or too about the pitfalls and loss of identity that lurk within nomenclature too and the secrets and intimacies of marriage are such that perhaps we shouldn’t quite dismiss the second Mrs de Winter as a doormat. There is another little coincidence, for me, in my chosen name for Mrs de Winter. 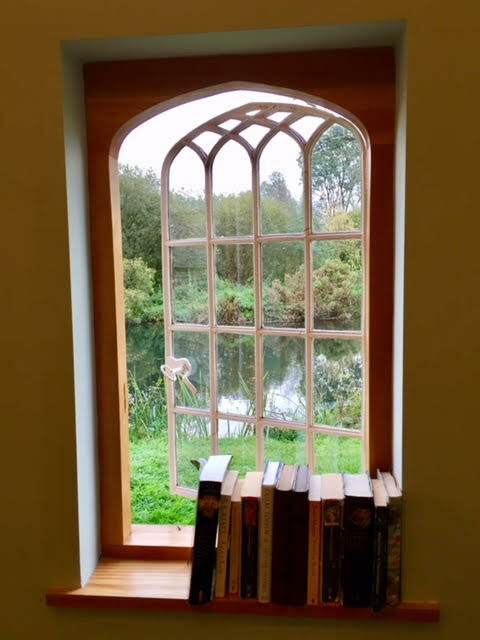 A few terms of interminable school life after I had first read Rebecca, I was in an RE lesson and a frantic fifth year blundered into the classroom “I need to get my mar … ana’, she muttered. Incidentally, the Internet copy of ‘Mariana’ that I just consulted for that reference was edited, in 1919, when du Maurier was 12, by Sir Arthur Quiller Couch. Quiller Couch or ‘Q’ was a great friend of the du Maurier family and an early literary influence on the young Daphne. Could she have …? Du Maurier is no help on this one, authors seldom are, the brutes. Whenever the question of The Name came up, she just said that she found the device interesting. I like to believe that she knew her narrator’s name; I think that, whether she did or she didn’t, would tell us a great deal about how far du Maurier identified with or despised her heroine. But she may well not have known, when someone asked her whether Rachel, in My Cousin Rachel, was guilty, she said, ‘I think she probably was’ just as, when it was suggested to her that Mrs Danvers was a lesbian, she agreed that she might have been. So awkward of her. Writers, quite rightly, don’t give away all their secrets, sometimes because their characters are too close, too unbearably real and you don’t shop your friends to the press, sometimes because they don’t want to be sued for liable and sometimes because they don’t know: some writers have a very workmanlike attitude to characters, they are there to perform a function in a book, at least that’s what they tell us… Of course, that little space to run around in is an author’s last great gift to us. And we should use it. Roald Dahl said in The BFG that those last few blank pages in a book were so that children could keep writing the story themselves, so get writing or, better still, get imagining. Serious students of literature should look on this as a cautionary tale, of course: read the text carefully. One wrong detail and who knows where you’ll end up? But for the rest of us, that’s the joy, we should all chase the rabbit. I have a bee in my bonnet about what colour Rebecca’s drawing room is.